Photograph of the Massawippi River. Photograph of Bishop's campus with flooded field in the background. Item is a reproduction of a photograph of the the St. Francis river in flood in September 1924. The photograph was reproduced in 2008. Item is reproduction of a photograph of the St. Francis river in flood in September 1924. The photograph was reproduced in 2008. Item is a photograph of the Topatco factory on fire with firefighters trying to put it out. Item is a photograph of the Topatco factory on fire in giant blaze, with one man visable in the corner. Item is a photograph of two firefighters standing in the smokey ruins of the main building of Stanstead College, after it was lost to fire. Item is a photograph of the rubble left from the main building of Stanstead College after it was lost to fire. Item is a photograph of the main building of Stanstead College after it was lost to a fire. Item is a photograph of the main building of Stanstead College on fire. The building was lost in this fire. Item is a photograph of smoke coming out of the Topatco factory after a fire occured, four men are staig in front after putting out the fire. Item is a photograph of the surrounding area of the Topatco factory with many people looking at what is left. Item is a photograph of a road leading to Stanstead covered in floodwater from the Niger river, with three men standing in it. Item is a photograph of the Boynton River flood during the spring with a building in the background. Item is a photograph of the Boynton River flooding during spring, with a barn like building in the background. Item is a photograph taken March 20, 1948 of two houses damaged by a flood that occured in Bromptonville, debris is visible around the houses. 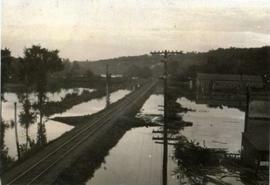 Item is a photograph taken March 20, 1948 of flood water with a lot of debris in it as it passes through Bromptonville. Item is a photograph taken March 20, 1948 of flood water destroying a house, a lot of debris is visible in the water. Item is a photograph taken March 20, 1948 of flood water passing by a house located in Bromptonville. 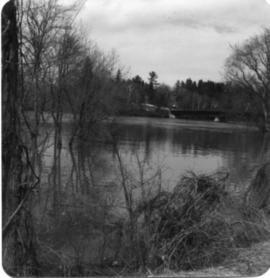 Item is a photograph taken March 20, 1948 of floodwater in Bromptonville, with trees visable in the background. Item is a photograph taken March 20, 1948 of floodwater with debris around a few homes located in Bromptonville. Item is a photograph taken March 20, 1948 of a street after a flood occured in Bromptonville, large sheets of ice and debris from the flood are visable.